Shu-Cheen Yu brought you the smash-hit album, Lotus Moon. Now we present her second album, Willow Spirit Song. Filled with the most beautiful folksongs from the Orient you are ever likely to hear, there are songs from Shu-Cheen’s homeland, China, interspersed with those from Indonesia, Japan, Korea, Pakistan, Sri Lanka and Thailand, all arranged masterfully by composer, Julian Yu. It’s impossible to name favourites on this album; some are intensely tragic, some are light-hearted and fun and others are dramatically exciting. Make sure that you read the translations of these songs which give real added enjoyment. 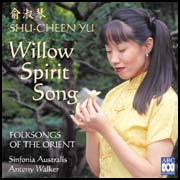 Shu-Cheen's divine voice and charming delivery will enchant and delight everyone who hears Willow Spirit Song. CHINESE Why Are The Flowers So Red?